It's more than a horse show. That's what I was told a few minutes before entering the Odysseo White Big Top. 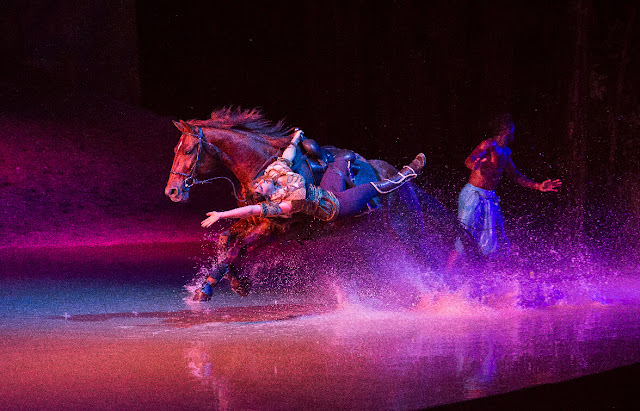 This week, my family was very fortunate to receive VIP Rendez-Vous tickets to Cavalia Odysseo, which is open near the Hersey Centre in Mississauga, and to tell you the truth, I didn't know what to expect. 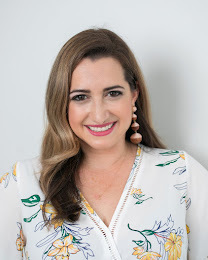 Was it the circus? An equestrian show? Dancers? There were going to be horses, this much I knew, but I quickly realized Cavalia Odysseo is more than a horse show. Much, much more than a horse show. It's a performance unlike any I've ever seen. Artistry, athleticism, delicate movements and grace. Odysseo plays out like a ballet, an opera and a comedy all wrapped into one, and without any words. 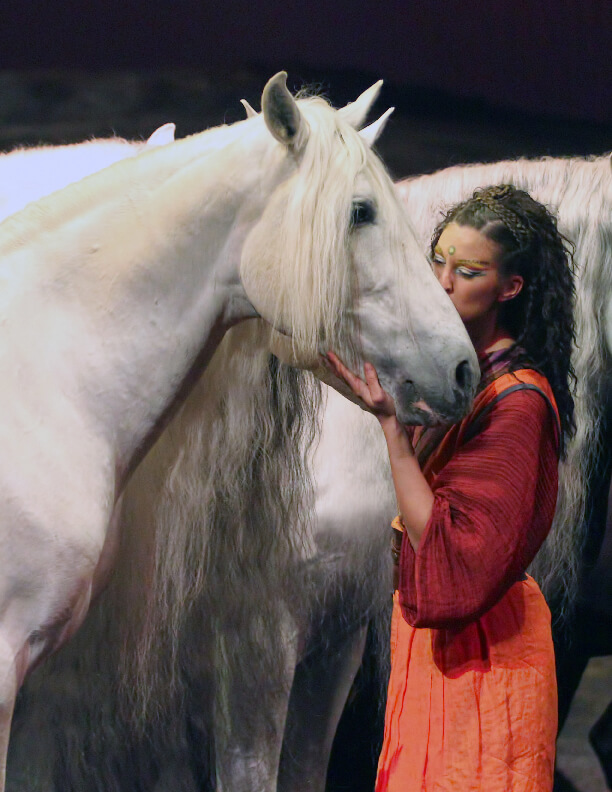 The inspiration for Odysseo came from the ancient relationship between human and animal, and this harmony is played out exquisitely. 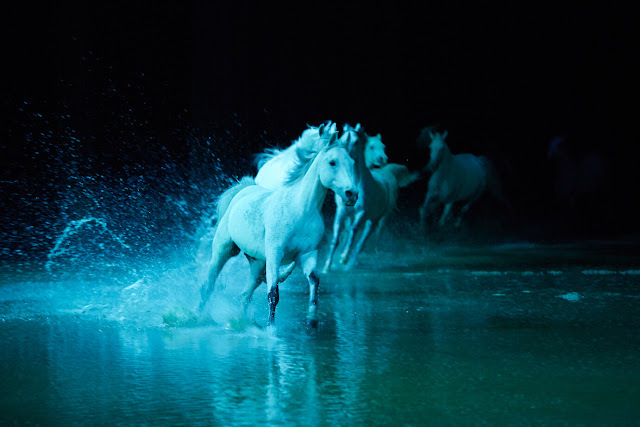 There are 65 majestic horses and 50 riders in the cast of Cavalia Odysseo, making it the world's largest touring production and travelling big top. The horses hail from Spain, Portugal, France, Germany, Australia, the US and Canada and train at the Cavalia Ranch outside of Montreal. It takes years to train a Cavalia horse, I learned, and horses learn multiple roles in the production in order to prevent boredom for the animal. On average, each horse performs for about 12 minutes. And they certainly steal the show. The movements and respect between the riders and horses needs to be noted, because you often forget that while there may only be one person on stage, there are many more horses. Horse and human are a beautiful partnership and the trust each puts on one another during the performance is evident. These animals are graceful and almost balletic in their movements, but each one is also a powerhouse -- galloping at high speeds at various points in the show. They complete rhythmic revolutions, bow, trot and dance. And even occasionally, play tricks on their rider, leaving the audience in stitches. And I have never, ever, seen a horse roll over and toss turn. There are tricks, too, of course, and some that seem terrifying and dangerous: riders flipping over their animal, standing on the horse, riding upside down. But this pas de deux is not only methodical and trained, it's also seems almost natural. Like the horse would never intentionally hurt its rider and vice-versa. 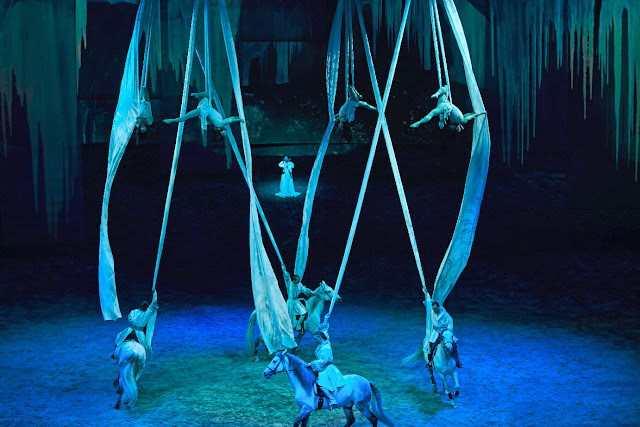 Of course, as we know already, Odysseo is more than a horse show and the amalgamation of acrobatics in this performance only elevates the already-super impressive spectacle. It sounds cliche, but the acrobats and aerialists in Odysseo defy gravity. They amazingly float through the air, on silks and on rings, while audience members hold their breath until their descent. 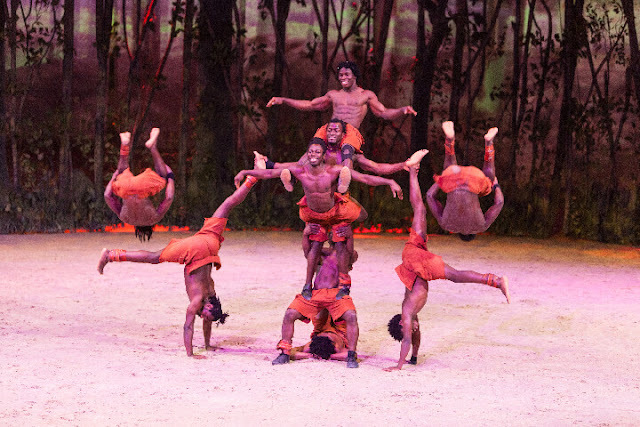 The choreography is more than simple elements and stunts; the strength of these performers is immeasurable. When one can hold their body hundreds of feet in the air by one limb, the audience is undoubtedly left in awe. Quite literally, too, with mouths open. I may have closed my eyes a couple of times. And then there were the dancers and gymnasts, who offered beautiful comedic interludes, from their impressive flips and tumbles to their contagious laughter and chants. Whether it's the Carousel scene, or the angels on silks, or anything in between, you're almost left dumbfounded -- is this happening right in front of me?! Is this a movie?! And almost instantly, the crowd breaks out into cheers and applause every single time. 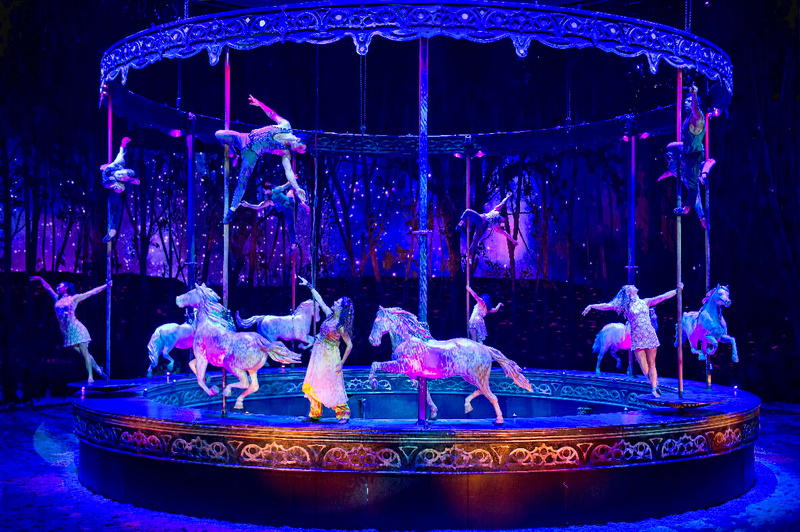 I'd be doing a disservice to Cavalia and Odysseo if I didn't at least mention the staging of this performance. What starts as a very simple open space transforms throughout the show to reveal a large, sandy, hilly dessert with the horizon in the background. And when you think you'd seen it all, half of the stage becomes engulfed in water for the finale. None of this was an accident, of course. The creators of Odysseo wanted to push the limits of live entertainment and I'm confident they have succeeded. We brought two children under the age of 6 to this performance and they were focused through the entire show, which is about two hours in length, with one intermission. This energetic, skilled performance is appropriate for audience members of varying ages. 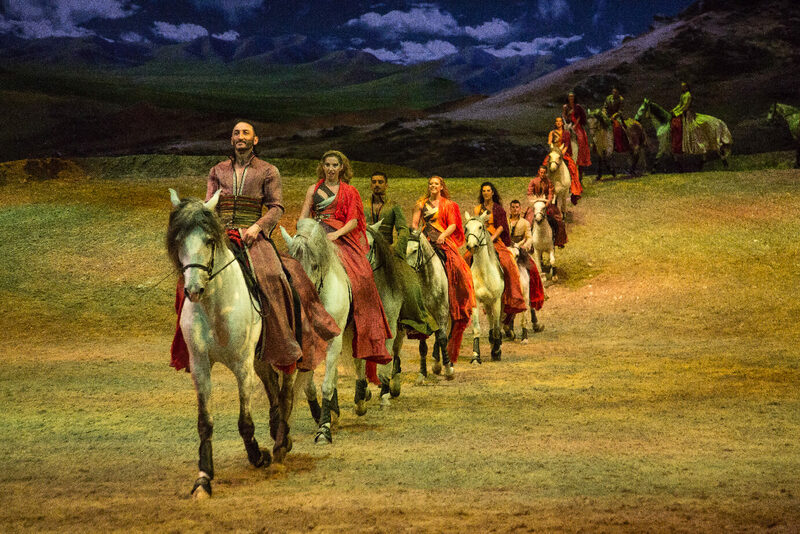 I feel like I use the word amazing and awesome a lot, so how's this: Cavalia Odysseo is spectacular, outstanding, extraordinary, unique and breathtaking. And it's definitely more than a horse show. 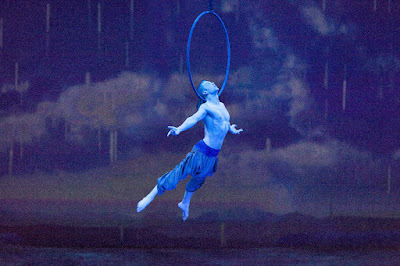 Cavalia Odysseo is open in Mississauga through July 23 and tickets are now on sale at cavalia.com/live. 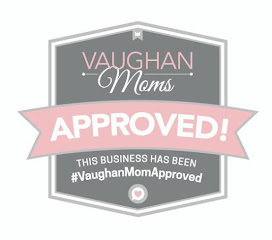 Ticket pricing varies from $39.50-$139.50 plus tax and applicable fees. Use PROMO CODE: SOCIAL to save 15% on all Gold and VIP Ticket Categories. Group rates also available. Disclaimer: I received tickets to Cavalia Odysseo in order to write this review. 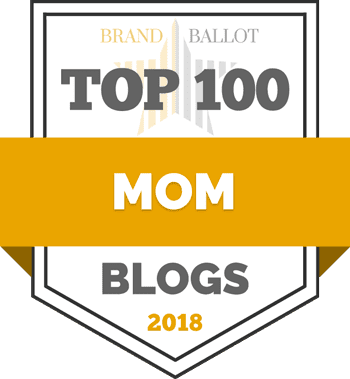 As always, the opinions expressed on this blog are my own.